Subscription services have proliferated in recent years, as a tech-adjacent e-commerce startup fad. But they aren’t new. As you can see from this photograph, not even gadget subscription services are new! Your newly flush postwar grandparents were also susceptible to the lures of souped up flyswatters and such. Mary Lou Moffitt, a 29-year-old Los Angeles advertising woman, has come up with a merchandising idea which is an apparent success. The Gadget of the Month club, Inc. Founded early this year, the club now claims close to 150,000 members - all of whom have paid from $1 to $5 for the privilege of receiving some gimmick not yet offered on the national retail market every 30 days. 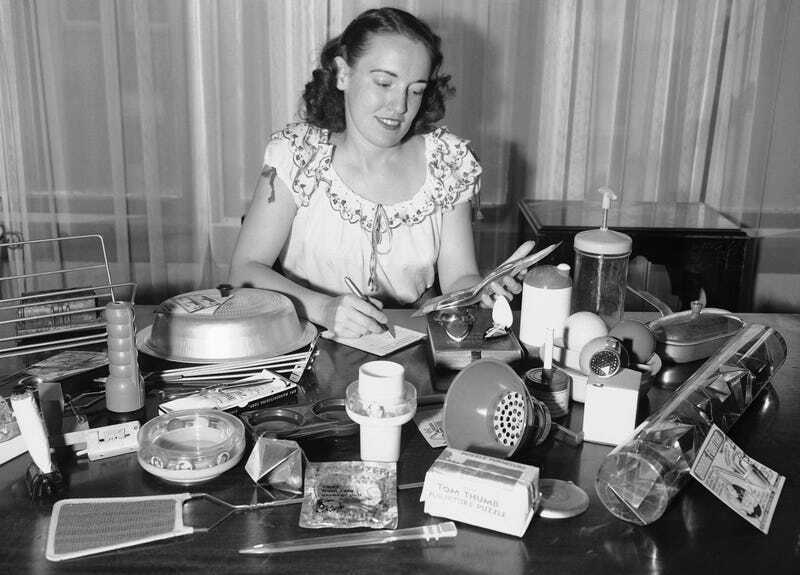 Miss Moffitt is at her desk in Los Angeles, Sept. 16, 1947. What better way to reward yourself for making it through the deprivations of the Great Depression and World War II than a monthly whosit delivered by mail? The G-M-C, which grew from a mere handful of subscribers to its present several hundred thousand, gives its members a mysterious little package every month in the year. The package may contain anything, from a combination letter opener-letter weigher to the latest in car washing accessories. The paper also explained that “Southern California, mainly Los Angeles, leads in quantity and quality of ideas submitted to the gadget club. What’s more, there are just as many women submitting ideas as men.” Golly!